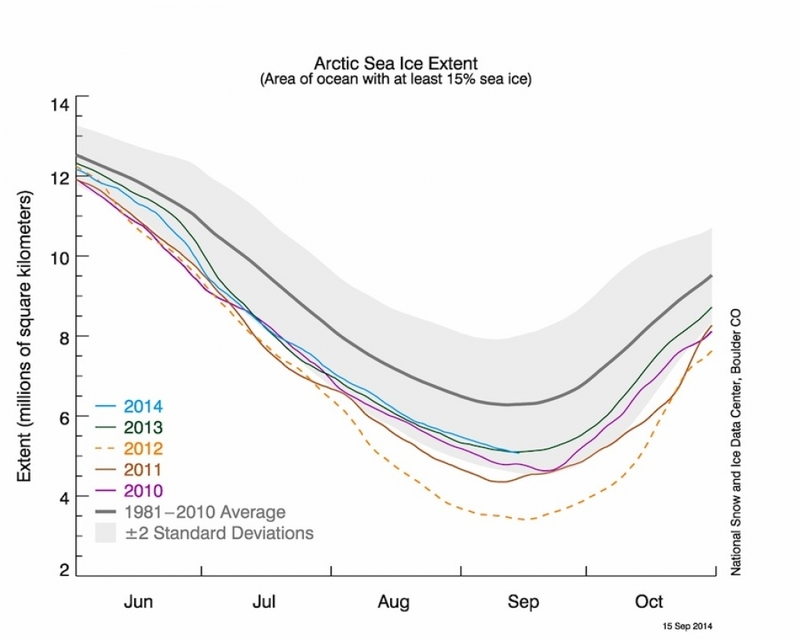 As summer draws to a close, the Arctic sea ice melt season is coming to an end. And while the season didn’t top 2012’s astounding record melt, it has still resulted in what will likely be the sixth lowest September minimum ice extent on record. 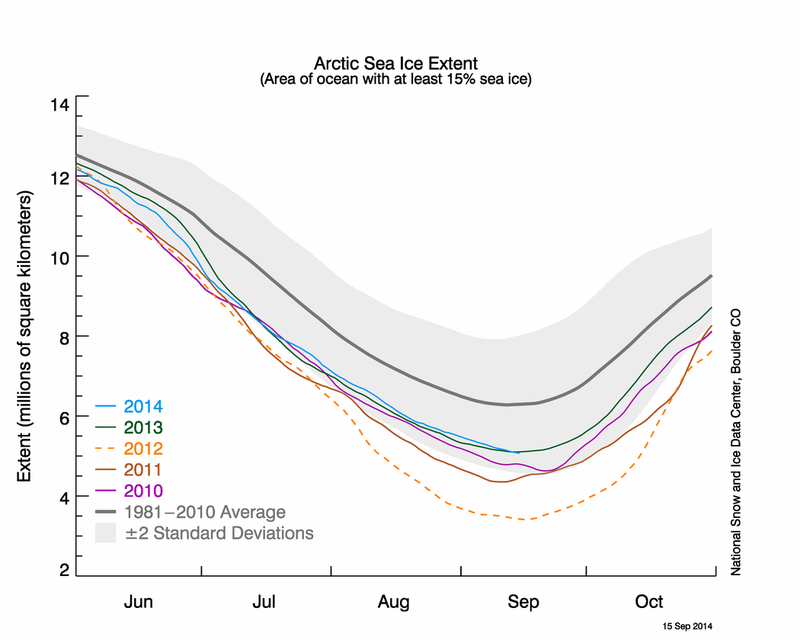 The extent, or area, of Arctic sea ice on Sept. 16, 2014, as it approached its minimum at the end of the summer melt season. 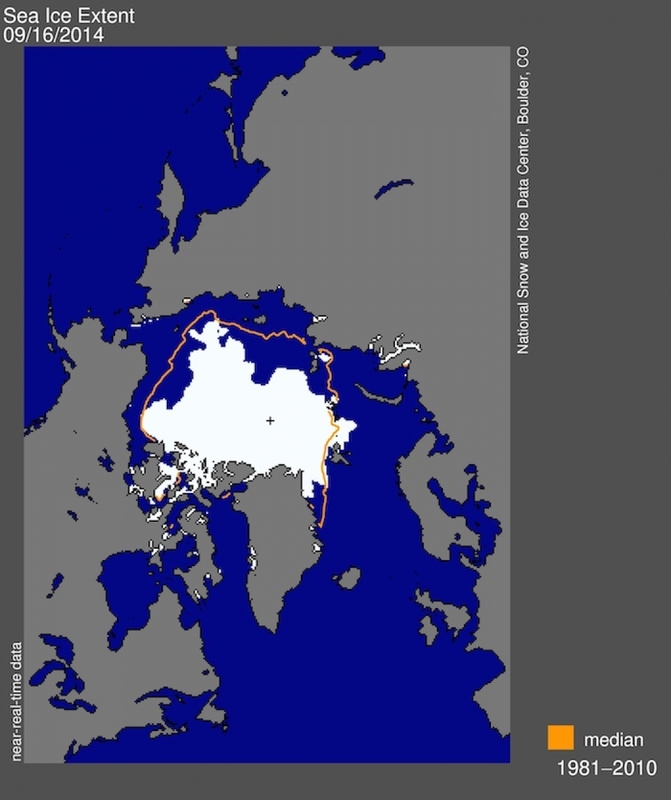 The orange line shows the average extent of sea ice for the period from 1981-2010. The extent of the ice on Sept. 15 was 1.96 million square miles, according to the National Snow and Ice Data Center (NSIDC), and wasn’t expected to change much over the coming days. That extent was 11,600 square miles below last year’s summer minimum and 440,000 square miles below the 1981-2010 average. The 2012 minimum reached 1.32 million square miles. “It hasn’t been a super interesting summer, that’s for sure,” said NSIDC scientist Julienne Stroeve. But it fits in with what she calls “the new climate regime,” fueled by greenhouse gas-driven warming. The melt did result in one notable statistic according to Stroeve, though. In the Laptev Sea off the northern coast of Siberia, open water came within five degrees latitude of the North Pole. This area has always had at least some ice cover since satellite recordkeeping began in 1979, even in some of the most dramatic melt seasons. 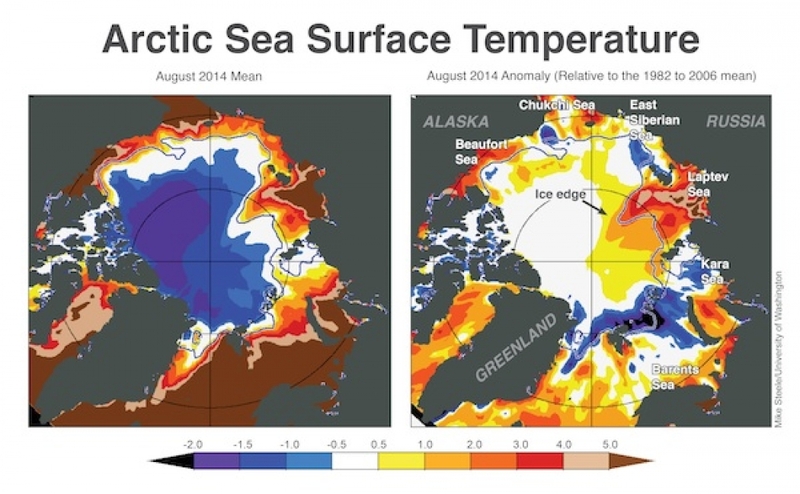 Very warm sea surface temperatures that were up to 9°F above normal in the Laptev Sea combined with persistent southerly winds from central Siberia, a very warm spot on the globe this summer, to clear the region of ice. That has resulted in “the most northerly position that the ice edge has been recorded over the period of satellite observations in this region,” according to a Sept. 15 NSIDC statement. Overall, the 2014 summer melt continues the long-term trend of ever dwindling sea ice due to amplified Arctic warming. The area of the Arctic Ocean covered by a layer of sea ice always waxes and wanes with the seasons, reaching a maximum at the end of winter in March and a minimum at the end of summer in September. Average sea surface temperatures across the Arctic Ocean during August 2014 (left) and how much those temperatures differed from the 1982-2006 average. But warmer global temperatures fed by increasing greenhouse gases have set off a self-feeding cycle at the pole where bright white sea ice, which reflects incoming solar rays back to space, melts more than usual, leaving more open ocean, which absorbs that radiation. This absorption increases temperatures even more, causing still more ice to melt. The average annual sea ice extent has been declining by 4.52 percent per decade, according to NSIDC statistics — that amounts to a loss of about 20,500 square miles of ice per year. The September minimum has seen an even steeper decline of 13.7 percent per decade, or about 34,000 square miles per year. Some projections have found that the Arctic could become ice-free during the summer by the middle of the century. This decline is of concern because the state of the Arctic influences the global climate and weather, and the sea ice is a key component of the Arctic ecosystem. The decline of Arctic sea ice since the beginning of summer 2014 compared to other recent years and the 1981-2010 average. While the minimum extent is well above the record low extent of 2012, it is still significantly below the average. 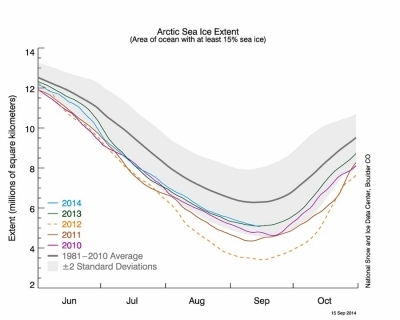 The higher 2013 and 2014 extents compared to 2012 doesn’t mean the sea ice as a whole is making a comeback, Stroeve said, given it’s likely sixth place ranking. Part of the reason sea ice extent can grow back after a record low year is that the overall warming is just one factor affecting the ice cap. Year-to-year weather variability is also a major player. One reason 2013 and 2014 had comparatively more ice was the lack of unusual weather patterns that drove a surge in ice melt, as happened late in the summer of 2012, Stroeve said. Also, “this summer and last summer were not particularly warm,” allowing some areas of sea ice a chance to recover a bit. For example, the first-year ice that survived last summer in the East Siberian Sea saw some regrowth and is now slightly thicker second-year ice. Older, thicker ice is better able to withstand melting, but it has been declining overall in recent decades as well.